Please contact owner Demetri at 678-613-five four five eight. Boat is located in Mcdonough, Georgia. 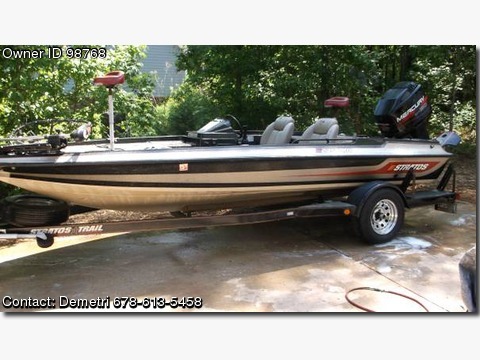 PRICED REDUCED FOR A QUICK SALE 1991 STRATOS 17.5 FT BASS BOAT WATER READY NEEDS NOTHING MECHANIC WISE, NEEDS CARPET REPLACED, AND THATS IT, HAS 4 BATTERIES ALL NEW, 76 LBS 24 VOLT TROLLING MOTOR, EVERYTHING WORKS, HAS 2 FISH FINDERS ONE IS A EAGLE COLOR MONITOR, THE OTHER IS A HUMMING BIRD, ALSO HAS A IN HULL DEPTH FINDER, ROD STORAGE THAT I CARRY 20 RODS AT MINIMUM IN IT, LIFE VEST AND OTHER STORAGE COMPARTMENTS, ALL GUAGES AND SWITCHES WORK BUT THE TRIM, ITS A NEW GUAGE BUT NEED THE PICK UP UNIT, HAS A JACK PLATE AND A BRAND NEW 26 PITCH SOLAS PROP YOU CAN PUT A SMALLER PITCH TO A 23 TO GET AROUND 68 TO 70 MPH BUT YOUR RPM WILL BE HIGHER, HAS A 150 HP ENGINE AND THE LOWER UNIT IS STILL UNDER WARRANTY THROUH SEI, COMPRESSION IS OFF THE CHARTS, WE CAN WATER TEST IT AND COMPRESSION TEST. TRAILER HAS LED LIGHTS AND BRAND NEW TIRES AND NO ISSUES.THIS BOAT IS FAST AND HAS A HOT FOOT, HAS PERKO SWITCH INSTALLED, AND BOAT HAS A COOLER AND BRAND NEW LIVE WELL PUMPS AND ALL WORK. CALL OR TEXT 678-613-5458, DROPPED PRICE AGAIN FOR A QUICK SALE.